Adapting to new technology can be overwhelming. Fear of change is real, and the unknown can create internal challenges. Most of the time, when emotion is tied to change, it’s due to a lack of overall understanding. 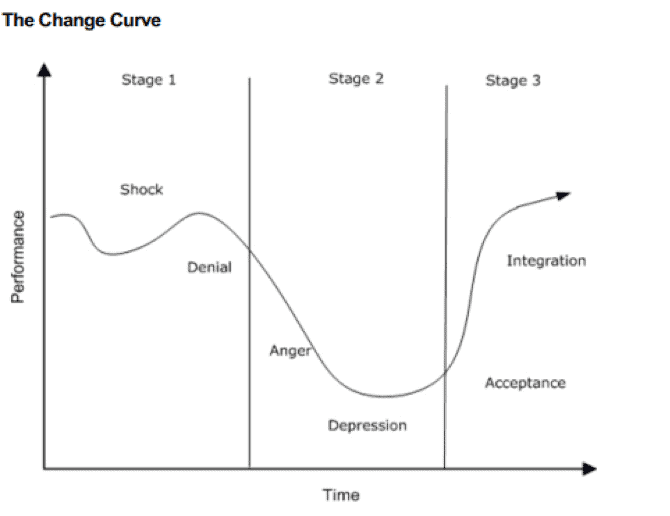 Let’s look at the change curve first developed in the 1960s by Elisabeth Kubler – Ross. She looked at change through the lens of grief, and we can use her model to help us understand the very human tendency to resist change. Stage I – Shock and Denial – this stems from a lack of information, fear of the unknown, fear of looking stupid or doing something wrong, and an overall lack of understanding can and will impact your team. Communication is essential to elicit different responses in correlation to change. Stage II – Anger and Depression – this can become a strong reaction or resistance to the change once there is more knowledge about the amount of work or seemingly the ‘disruption’ it could cause. There could also be a lack of belief in the necessities behind the change. Stage III – Acceptance and Integration – if team members can get past stage II and see the benefits that come with the transition, they will be successful with their adaption to change. The common denominators of overcoming the different stages are time and knowledge. Each person needs a certain amount of time to adjust to any type of change. They need the knowledge to gain confidence in the overarching ‘why’. To manage change successfully, educate your team on the reasons behind any changes or adjustments being made. Technology specifically is changing at a rapid pace and we as a society are expected to change with it and keep up. These types of changes in processes and technology can feel disruptive, even though they’re moving us into a more productive place. Mobile solutions, cloud computing, decreasing cost and increasing functionality, social impact, consumer impact, and effective business strategy and organization are all results of positive technology enhancement and impact. The largest part of accepting change is understanding the benefits and efficiencies that will be achieved. It’s about being proactive vs reactive. Understanding how change impacts your organization and having a proactive plan in place to overcome the emotions that come with significant change, especially with regards to technology. If you set a strategic change management/change readiness plan in place to give your team members the right knowledge, confidence, and timeline to adjust their confidence and competence and you will see positive results and a better outcome. Visit our individual training course schedule here to learn how to adapt to technology and ultimately adopt it! We have courses on productivity, collaboration, and integration that can assist you and your organization in feeling more confident with technology and the constant change that comes with it.